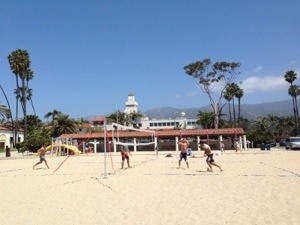 The Waterfront Parking lot in Santa Barbara is close to the beach, cafes, and any water sport you can imagine. If there is a five- star electric vehicle charging town, Santa Barbara is it. 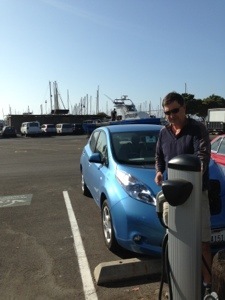 We chose one of the two ChargePoint chargers in the harbor Waterfront Parking lot. Even on a sunny, beach day in a holiday weekend as the parking lot filled up, drivers left the EV parking spot next to ours vacant. The parking attendant gave us a flyer about the charger as we pulled in to the lot. This Level 2 charger is a little tricky to find. Take the Bath Street exit, follow to Shoreline, turn right on Shoreline and then left on Harbor Way and left into the lot. Get ticket at first gate, drive to second gate and look for chargers on the left near the Los Banos Pool. The Nissan Leaf GPS works as well for navigation as the Plugshare app. I typically search for the charger on the app and then use those directions or type the address into the Leaf GPS. The later works better if you do not want to keep checking your smart phone or you are in the car solo. There is a public bathroom (closed for cleaning 8:45 am to 10 am) nearby which is a great place to change if you decide to rent bikes like we did. You can rent a kayak, a SUP, surf boards, you name it. There is a skateboard park, sand volleyball, a zoo and Santa Barbara beach all within walking distance. We drove 79 miles from Topanga, arriving here at 8:30 am. I was tired and discouraged when my husband checked the Nissan Leaf app and found that we would have to spend six hours charging. The low battery warning beeped when we arrived. Keeping the windows open with no air conditioning to save on juice is getting a little annoying too. We stopped at State Street Coffee and after some caffeine and a snack, I felt better and we mapped out a plan. We rented cruiser bikes at Wheel Fun Rentals and headed down the waterfront bike path, stopped at a memorial on the beach for fallen soldiers and headed toward a bird sanctuary. I do not recommend walking through the later as we did. It appeared to be a haven for homeless people as much as birds . 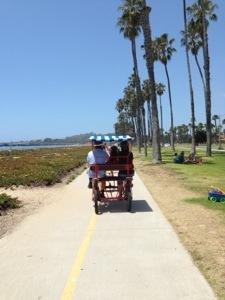 The palm- tree lined bike path is great, if crowded, and artists sell their wares along its path. We meandered along the path, then jumped into the ocean for a swim. 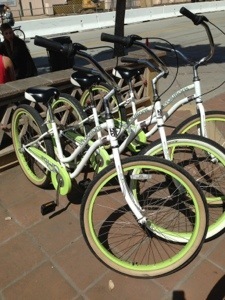 After going back to the car to change at the restroom, we returned the bikes and walked downtown. 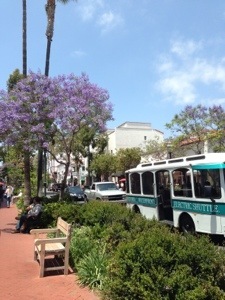 After a little shopping (there are stores and cafes galore) and lunch, we hopped on the city’s all- electric shuttle bus for a ride back to the wharf, just a short walk from the car, which was fully charged and waiting. Santa Barbara has a peaceful botanic garden and there is a charging station there. The mission is one of the best in California and well worth a visit too so check for chargers near there. Also, I highly recommend bringing bikes on an EV Roadtrip if you can. We paid $54 for two bicycles. Ouch! Now we are on Highway 154, trying to take a slower, energy saving pace en route to Santa Maria, which we hope will be our last charging stop before we reach tonight’s destination of Paso Robles. Thanks for all the info and pictures. FYI, because of the aerodynamics, driving with windows UP and a/c ON is MORE efficient (=better mileage) than driving with the windows down and A/C off. Best of both worlds. Thanks Michael. I’d love to see the sourcing on that. From what my husband has read for traditional cars, it’s a toss up. Of course, he likes the windows open so he could just be making his case. 🙂 It would be great to have proof to make mine. Thanks for reading. In looking at other comments and columns on this though, it seems that there is a fair amount of debate about when exactly this “pertains” — i.e., speed of the ‘breakeven’ point, types of vehicles, etc. But I think it’s fairly safe to say that for a LEAF at speeds 40 and above, it is better to use the A/C and roll up the windows. Thanks for the kind words regarding our fair city. 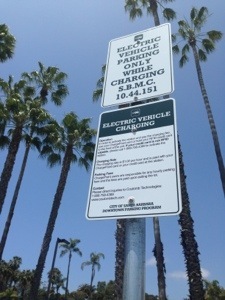 Santa Barbara’s charging stations with free parking are a couple blocks north of the wharf and there are 6 more in the downtown area, and many hotels, businesses and workplaces are starting to add them. 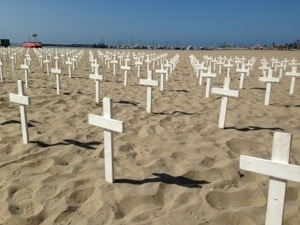 Check out http://www.PlugInSB.org for more info on the work we are doing to get EV Ready. Thanks Michael, and thanks for the additional information. 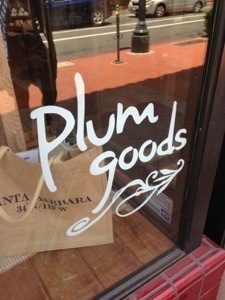 We were happy to find so many choices in Santa Barbara. We did pay to park at the Harbor Waterfront lot. I would love to know more about why the city decided to become a leader in this area.